So today is the day, the big three zero. Yup, I am now 30 years of age. It is for 3 of those 30 years that I have been blogging on this here site, documenting travels and blogging triumphs/failures. My style has varied from time to time, but my spelling remaining steadily terrible. I like to be consistent in that area. Over those 3 years I’ve had the odd comment here and there that my website is not particularly personal, that it is hard to relate to. Is that by design? … well yes to be honest. I am not one who enjoys being in the spot light, having my picture taken, talking about myself or being talked about. Its strange I know, sometimes I even wonder why I blog when I am not a fan of those things. However, in an effort to open up a little about myself I have sat down and penned the below. Thirty facts about myself for the 30 years I have been on this earth. It doesn’t make up for 3 years of impersonal posts, but at least its a start right? 1. I was born at Hillingdon hospital in west London a full two weeks after my due date on April 6th 1984. My old man said I looked like a shriveled prune, he says this almost despite missing my birth owing to a heavy night out with his mates the night before. Lad. 2. I was part of a perfect 2.4 children household. I was the baby, my elder sister born 3 years earlier. 3. I never met either of my grandfathers, both sadly passing away before my birth. My dads mother also passed before my birth, but my mums mum lived with us for some 23 years, burning sausages at will. Her brother, my great uncle, was also like the grandfather I’d never had in a way and would visit often. I still to this day wear the ring my he gave me. 4. A a toddler I was both blonde and cute. Observe. 5. With my blonde locks, I was once on the Really Wild Show with Terry Nutkins. Sadly I only have this on VHS and so cannot show you, plus you’ll probably only find this amusing if you’re from the UK. 6. Throughout my childhood I was extremely accident prone. Aged 4 I broke my left arm pretty severely. My fall from a climbing frame led to a couple of weeks off school, two operations, two giant pins in my arm and a nice zip like scar. 8. Aged 12 I broke my left wrist in two places. More shame. 9. Aged 16 I tore the ligaments in my right ankle … Then I tore them again aged 23. In between that I broke my right foot at 21, and more recently at 28 I tore the ligaments in my right knee. Somewhere along the line I also diced my hand open with a knife whilst on a weekend away with the scouts, got a snooker cue in my eye and end up in a specialist eye hospital in Leeds, and I think I also got lego stuck up my nose at some point too, but I see that as more of a skill. 11. Whilst in cubs, I was for a time the record badge holder within my troop. Mad sowing and ironing skills! 12. When I hit around 13 I decided that curtains would be a good idea for a hairstyle, I was wrong. 13. Despite my awesome haircut and metal teeth, throughout high school I never once had a girlfriend. Shock horror. 14. I have had hair of many colours over the years, particularly during my time at university. I am unsure why, it simply seemed like a good idea at the time. This is me giving my sis a headlock on the night of my 21st after my friends had sprayed my barnet a lovely shade of pink. Fetching huh? Another time I got in at 2am slightly worse for wear and decided that colouring my hair blue and white in preparation for a big football game the next day would be a good idea. It really wasnt, and my team lost. Massive fail. 15. I have a degree in Sports Science from Brunel University … I put it to great use by now working in finance and travel. Sorry mum, sorry dad, I will pay you back one day. 16. I lived at home during university having changed my mind about which uni to attend at the very last minute. I was supposed to study at Bournemouth, but switched to Brunel. I think a lot about whether I should have moved away from home to study. I regret not taking what could have been an amazing opportunity. That said, had I moved away for uni, I am unsure I would ever have had the cash to go travelling. 17. My first trip overseas was to Ibiza with mummy, daddy and big sis. I was 3, and either too young or off my face on rusks to remember anything. 18. Aged 6 I was taken to Disney World in Florida. This is the first time I remember travelling overseas. I pretty much wet myself with excitement when I was given my Virgin Atlantic goody bag at the airport which much to my delight contained a hat AND crayons. Branson is a boss. 19. My first travels without my parents was to the Isle of Wight with my primary school. My first travels without my parents or any guardian was to Newquay on a surfing holiday with some friends. Newquay was my first experience of hostels and the joys of dorm rooms. Staying in the Offshore hostel in Newquay was the only time I have woken up to find a shopping trolley in the middle of the room. Boys will be boys hey? 20. I discovered my now love of travel almost totally by accident, and mainly because of boredom. Its not like I had never travelled before the age of 21, I had, as demonstrated above, but as also demonstrated it was mainly package holidays, and I was perfectly happy with that. Lads surfing holidays and family time in the sun were all I knew, and that was cool. Then uni ended. I had a degree but no idea what to do with it, and truth be told I was sick of the area I had now both lived and studied in for some 24 years. I racked my brain for something to do, I needed some direction and so combed the internet. One evening, after our modem had done it best impression of dubstep (dial up days) I impulsively booked a 5 week volunteering placement in South Africa. My mother was not best pleased when I walked downstairs into the family living room and announced I was off to another continent. They don’t half worry don’t they. 21. My first experience of backpacking was in South Africa, yup the same South Africa trip I referred to above. I didn’t plan to backpack however, I was only meant to volunteer for 5 weeks as a sports coach/teacher in Port Elizabeth. I made friends however and once our 5 week term was up a few of us got together and backpacked the garden route to Cape Town together. My travelling habits have rarely been the same since. That trip pretty much changed my life! So much so that within 12 months I was on yet another continent coaching football. 22. Returning from South Africa and leaving my new backpacking friends behind pretty much sent me into meltdown for 12 months. The travelling blues is totally real and I have been there, not having the energy to get up in the morning, loathing the 9-5 routine and feeling trapped in the place you grew up. I was in a pretty bad way for a while, although not diagnosed looking back I wonder if I was suffering from depression. Luckily I had a way out though, and 12 months later I had reached a goal of £10k and was off on my gap year. 23. As I climbed into my dads car heading for the airport and my gap year, I did not say goodbye to my sister. Its no secret among my family that for the best part of 24 years my sister and I hated each other, with a passion! Everyone said it would fade and we’d start to get on once we reached our twenties, but we proved them wrong in the worst way. We might have a week or so where we got on, but then it would all blow up again. Just before I left for Sri Lanka in 2006 we had another big fight and I left without saying goodbye. I think she got me a card, but I doubt I gave it a second glance. Nowadays however I am glad to say that for the most part we get on pretty well, I fix her computer a lot and she doesn’t push me down the stairs anymore. 24. Before I found travel, I was one of the fussiest eaters on the planet … and a bit of a fatty. Carbs and meat were the order of the day, every day, 365 days a year nothing with any real colour would I consume. I know people can change having been on the road for a prolonged period of time, and there were other elements of my person that altered during 11 months in Asia/Oceana, but none more so that my ability to eat greens, experiment with flavours, try new things appreciate what other people could provide or gift me with. So big was my change in diet, that when combined with my volunteer work in Sri Lanka and India, at one point I weighed in at 12.5 stone, a full 2.5 stone lighter than when I left the UK. Never since have I got back up to 15 stone, and whilst I still dont have the most adventurous diet of everyone I know (Onions are evil), its a lot better than it used to be. 25. Pigeons, I hate them. A nice positive note to kick off on, but now that I am 30 I feel it is my duty to act in a slightly more miserable manner. Seriously though, what is up with pigeons? Why do they fly straight at my face? And why do they wait until the very last minute to fly straight up into my face and force me into a entirely new direction, usually a direction where chuggers lurk (clipboard charity workers). Are the pigeons and chuggers working in tandem? Have the chuggers somehow trained those rats with wings to push new customers in their direction? It all looks a bit suspect to me. 26. As a child and to this day I am painfully awkward when it comes to being looked at. I am not a fan of my own appearance, and neither it seems are camera lenses of the world. Honestly, I just don’t know what you’re supposed to do when someone points a camera lens at you. Maybe it has something to do with having braces for so long, and not wanting or ever really learning to smile, but seriously check out how un-photogenic I am compared to all these other awesome and super photogenic bloggers. Photo courtesy over the lovely Brenna over at www.thisbatteredsuitcase.com. 26. Moving onto a slightly lighter subject, you may be glad to hear that I eat cheese pretty much every day, standard. My weekly intake comes mostly in the form of pizza, which if given half the chance I could eat most days without getting bored. Fat yes, bored no. 28. Almost every other Saturday throughout the year I can be found watching football with my dad. I have had a season ticket for my local football team for the last 12 years. When Saturday comes I am there, same seat, sat next to my dad and surrounded by friends we have got to know over those 12 years. To be honest I loath to miss a game and try my very best to arrange my travel around fixtures, a trait I no doubt picked up from my dad, who arranged his wedding to my mother with fixture list in hand. True story. I know football isn’t everyone’s cup of tea, and it doesn’t always come across well in the media, but few experiences can bring strangers together and provide a buzz like the below. 29. 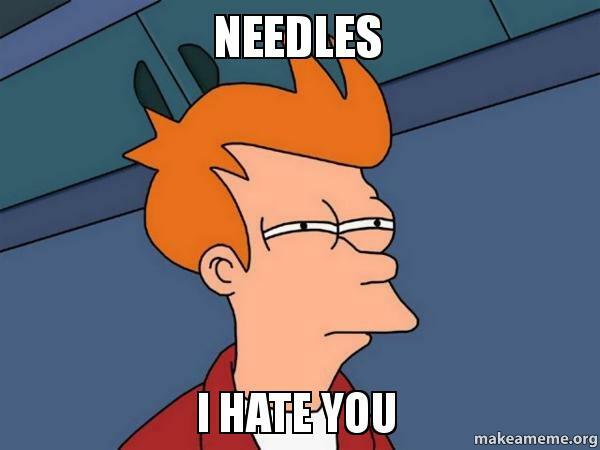 I am 100% petrified of needles. I never used to be and I thought that regular exposure to fears was supposed to desensitize you to them. Not in my case obviously, at 30 I am more scared of them than ever. Strangely enough though, I have had 3 piercings in my lifetime. All three failed to heal properly and pretty much fell out of my face/ear. After eyebrow piercings 1 and 2 I was told by the staff at the tattoo parlor that they’d never seen anyone go so white. After my ear piercing I full on fainted. Maybe this is why I don’t like needles!? 30. I have an unhealthy obsession with time and loath being late for anything. The consequences of being late are shaking, perspiring and general rage, it ain’t pretty. So bad is my obsession that I even have nightmares about being late for completely fictional events. It’s probably not ideal however that my girlfriend is unable to be on time for ANYTHING. Her being ready is very much like what I have heard refereed to on the road as Fiji or Thai time. So there you have it, that is me effectively. Feel free to commend me on my awesome hairstyles below, or ridicule me for my poor life choices, up to you. Also feel free to email me if you want my post address, all presents and cake welcome. I absolutely loved reading this! Great idea, great post. You definitely did get Lego stuck up your nose, you then got taken to a&e after dad failed to remove it from you nose with his pliers at home. Where you waited for 2-3hrs before sneezing it out across the waiting room!! Full story !! HAPPY BIRTHDAY NEIL! We’ve been countless times but it’s always nice to read a bit of ‘trivia’ about people you know. Some call it being nosey. OK, yeah, I’m just nosey. Love it! I should probably do a “25 facts 25 years” on my 25th birthday. Thanks for giving me an idea. @Sis – Like I said, a skill! @Victoria – Uncool? These are probably the best photos of myself that I own. Thanks for you comment. @Beverley – Thanks very much! Yeah nosey is fun sometimes though right? @David – To be honest I’d seen it elsewhere before, so can’t claim this as my idea. I think its always a fun read though, especially if the writers are able to poke fun at themselves a little bit. I’ll keep an eye out for your 25s post. Cool post Neil. How are you going to top this when your 40? Keep it coming. @sabretoothedchickenstour – Erm … I dont really know. Maybe write something about finally growing up between the ages of 30 and 40. Trying not to think about 40 yet though haha.